30-day guitar challenge: Here, we’re spacing chords across all six strings and leaving lots of space between each note, aiming for an open, airy sound. We’re using an Em-Am-Em-B7 progression as our starting point, allowing you to compare the contrasting results. The approach illustrates the enormous benefit of learning chord theory. If you don’t know what notes belong in a chord, you’re restricted to standard chord shapes. 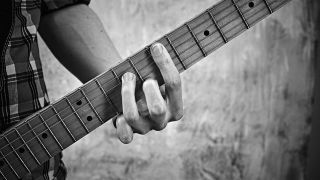 If you know the notes of, for example, E minor (E G B), you have the freedom to place them wherever you like across the full range of the guitar. In all of these shapes, almost all the intervals between the notes are at least a 5th (seven frets’ distance). That has a huge effect on the sound of the chords, creating a sparse, crisp sound – the opposite of last month’s lushness. We’re already working with quite a stark, austere kind of sound, and this is heightened by the use of suspended (sus4 or sus2) chords. So instead of using regular Em, we’ve swapped the G note for an F# here. Strictly speaking, this is Am7/E. By retaining the E bass note from the previous chord (a note that belongs in Am, anyway), we’ve created a little ‘aural glue’ to help join the chords. The only difference between Esus2 and Eadd9 is that in the add9 chord you simply add F#, while retaining the 3rd (G). This is a bit of a fudge, really. It’s a B7add11 chord, but there’s no B. No root note! If you like, you could add it on the second string, but we like the sparse sound without it. Also, it’s strictly B7add11/D# as the 3rd is in the bass.